Thanks for e-mailing me. While I do have quite a large data base on the Tétreau/Tatro, etc. 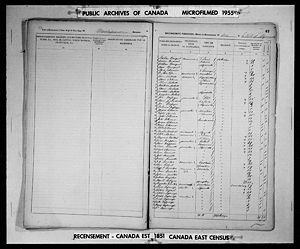 clan, there are quite a few that are not traceable back to Louis Tétreau because of a missing record, an incomplete record, or one that was not completely filled out in the first place. Unfortunately, your line is among these. I do have a Mary E Tatro born in Southbridge MA on 5 Aug 1890, her parents being Jacques and Amelia Simpson Gregoire who were married in Southbridge on 10 Oct 1887. It apparently was a 2nd marriage for both, as Amelia Gregoire's maiden name appears to be Simpson. The parents of Jacques are stated as Jacques and Sophia, but no maiden name for Sophia. It appears that he was married before to Sophie Lafforet (Laforest?) at Danielson CT on 17 Dec 1865, but there are no parents listed in this record. Jacques was born about 1845, no doubt in Canada. I scanned my data base for any Jacques born between 1840-1850 and came up empty. I'll keep my eyes open and if anything turns up in the future I'll be in touch.